There was one time I developed a constant crazy craving for prawns, so much that I had to call for an intervention. I’ll never get tired of them, I just need a more balanced diet (because who doesn’t?) Prawns are such versatile ingredients that there are endless possibilities of how they can be cooked: grilled, caramelized, pound into prawn cakes and fried or even raw. One of the many (lazy) ways I use to enjoy these little guys is to steam them and pair with fish sauce so I can feel the saltiness of the fish sauce, the chewy texture and sweetness of the flesh. And another (less lazy) way is to mix them up in a crunchy cucumber salad. I still remember those afternoons working while my mind was filled with the thought of how I would go to the supermarket, choose the prawn, pick up some cucumbers and dash home to make this dish. The dressing is something that I learned from co Nguyen Doan Cam Van, one of Vietnam’s most prominent culinary figures. I’ve watched her shows since I was a little kid, fascinated by the wonderful dishes she put up (to my 6-year-old eyes, everything was wonderful) and her soothing accent (not related to her culinary knowledge but it helps deliver the lesson). For her salad, she always uses a dressing that consists of 1 part fish sauce and 2 parts sugar, adding the acidity from vinegar or lime. You are going to get a flavorful wholesome salad, never a soggy tasteless one. 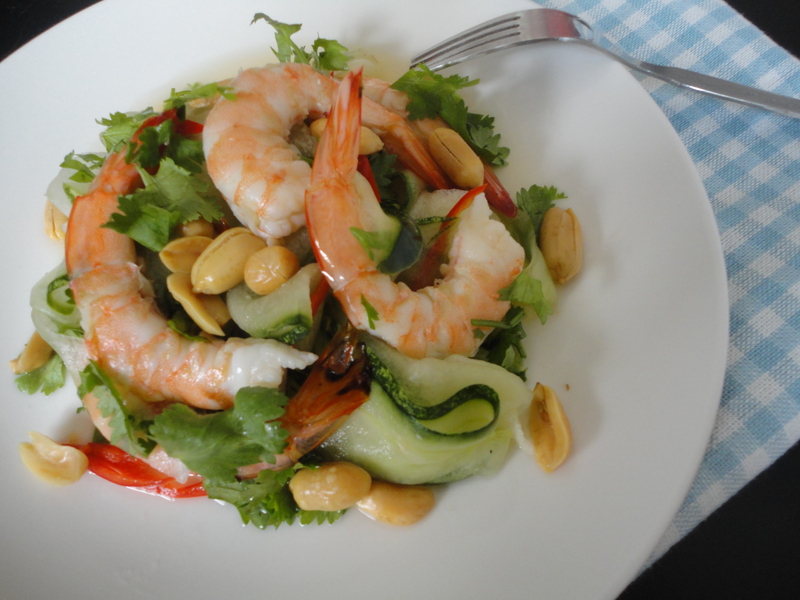 Initially my go-to recipe was to use the steamed prawns in the salad mixture. Then after a trip back in my hometown in Vietnam, something suddenly struck me. My uncle has a net that he always leaves at the pond outside the house which he “harvests” every other day. On a fruitful day, we will have all sorts of small fish and prawns. 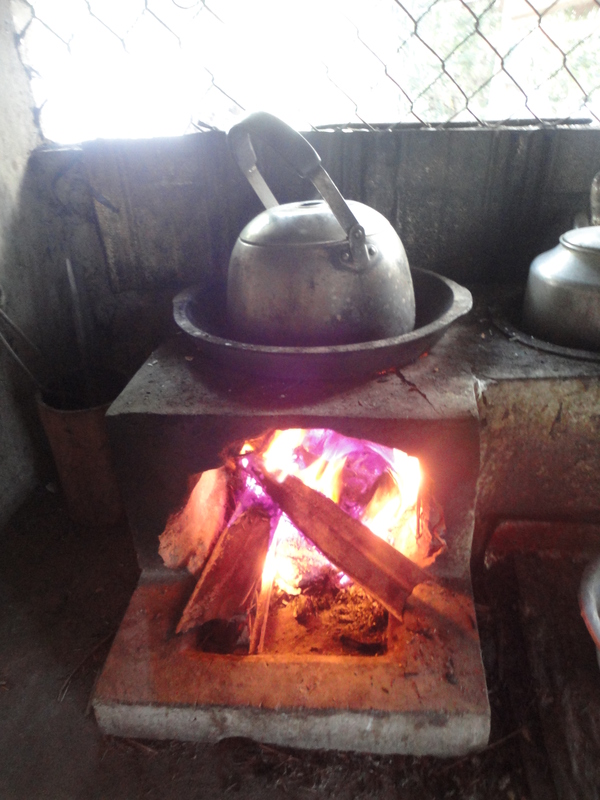 Fish go to our cats, and prawns go directly into the clay stove in a skewer. After a few minutes, we dug the skewer out of the flame and enjoyed the prawns. These prawns are usually small but they carry with them a beautiful fragrance and a rustic charred skin that signifies the food culture of the countryside, where preparation of ingredients is kept to a minimal so they can keep their natural taste. 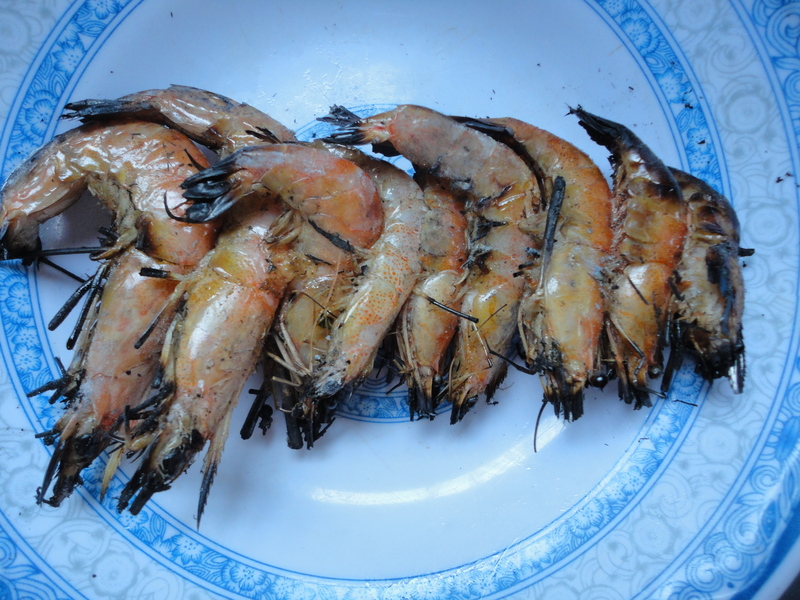 And here I was, instead of steaming the prawns I decided to wrap them inside aluminium foil and grill on the stove, trying to replicate my uncle’s clay stove skewered prawns. The result? 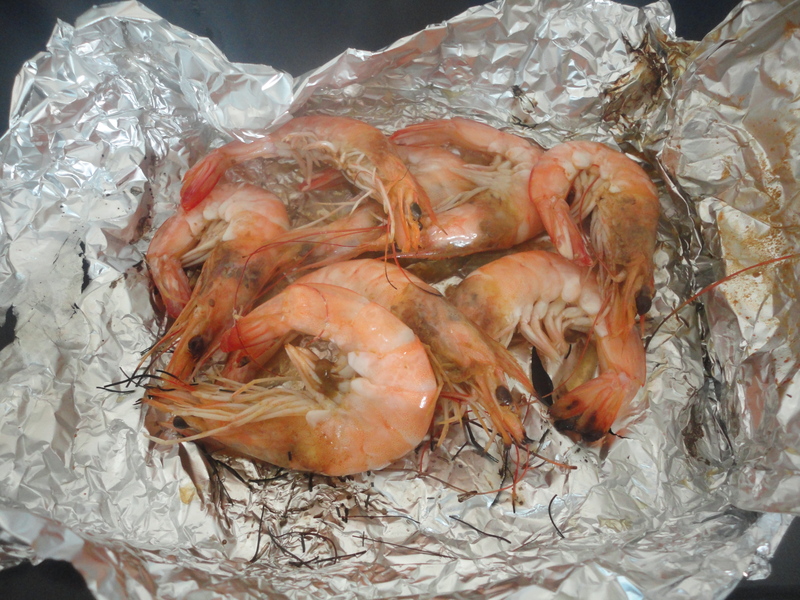 Let’s just say I couldn’t stop smiling from the moment the scent from the aluminum pack started to fill my kitchen to the moment I risked burning my finger just to peel the prawn and tried it. Although the charred skin effect couldn’t be replicated, I was happy with that smoky scent and that sweetness very much retained in the flesh. And that was my eureka moment. Prepare the dressing: Pour fish sauce and sugar in a saucepan and cook on the stove at low heat until the sugar dissolve. This is more than what you need for this, no worries, just store the remaining in the jar in the fridge so you won’t have to make again next time. 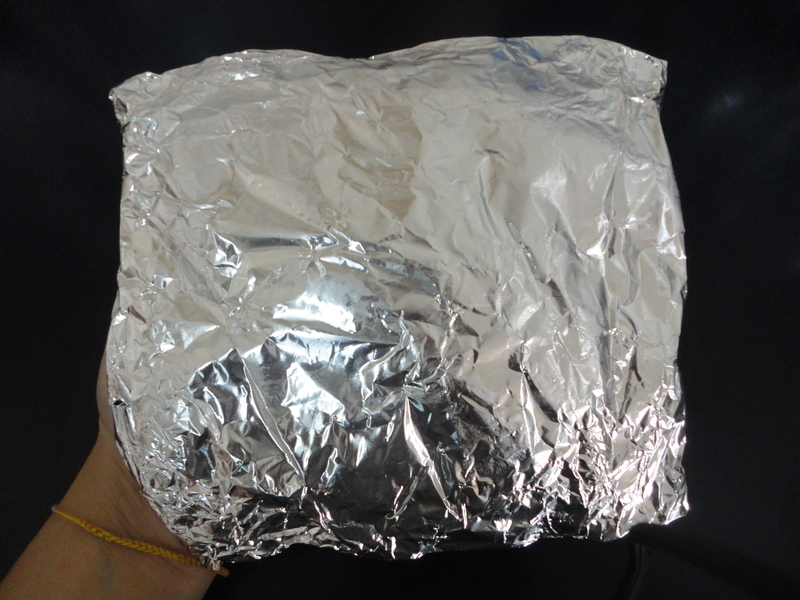 Prepare the prawn: wash and pat dry, wrap them in aluminium foil and place on stove top, cook for 5 minute, turning twice. When you start to sense a smoky smell, you know it’s done. In a mixing bowl, mix cucumber, red chillies and prawn together with lime juice and 2 teaspoons of the dressing. You can adjust the amount of dressing and lime juice to taste. Garnish with peanut and chopped coriander or Chinese parsley and you’re good to go!